As UNT's agent, the Collegiate Licensing Co. (CLC) licenses elements of our trademarked brand identities — UNT, University of North Texas, Mean Green, North Texas (in our proprietary font), our diving eagle design and others. Vendors seeking to use any university-owned identity elements must be licensed by the CLC. 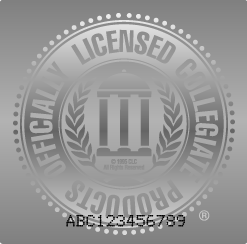 All products made by official university licensees sold through retail outlets must have the Officially Licensed Collegiate Product (OLCP) hologram tag or sticker (see below). If you find a product for sale that does not have the tag or sticker, please email us. In your message, please include a product description, the manufacturer brand, the retailer name and retailer location, if possible. All apparel and commemorative and promotional products ordered by UNT units for internal use are exempt from royalties, but university units must use CLC-licensed vendors. 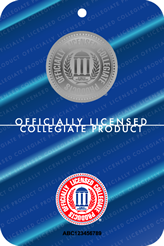 If you are interested in becoming a UNT/CLC licensed vendor, please visit the Collegiate Licensing Company's website. Once you choose this selection, you will be prompted to enter information about your company. Once you have filled out the form, select “Submit.” This will take you to a page containing the licensing application in a PDF format. Once you have filled out the application along with other specified requirements, please send it to The Collegiate Licensing Company for processing. Please note this process can take up to two months. After downloading and reading through the licensing application, if you still have any questions, contact the CLC at 770-956-0520 and ask to speak to Ryan Prowell. All products ordered by university departments for internal use are exempt from licensing fees, provided they are not for resale. Informational uses of the university marks, such as use by the media for purposes of identifying the university, are exempt from licensing fees and do not require a licensing agreement. The university, through URCM and in collaboration with the Athletics Department, reserves the right to exempt any user from licensing fees if circumstances warrant exemption and if the exemption is in the best interests of the university. For an exemption, contact 940-565-4814 or by email. Student publications and products such as T-shirts or notepads produced by students for use by their university-recognized organizations are exempt from licensing fees. Items to be sold as fundraisers are not exempt. In either case, licensed vendors or university service departments must be used for production of these items. To obtain an exemption contact 940-565-4814 or by email. Lists of vendors are available from the CLC's website. All promotional items must include the university's lettermark and wordmark and must be approved in advance by URCM. This is automatically completed through the purchasing and payments process. The Business Service Center (BSC) will not approve your branded purchase without URCM approval. To obtain URCM approval, email us a PDF of what you wish to do. If you have questions, contact 940-565-4814 or by email. University units may not use credit cards for the purchase of advertising specialty items, unless permission is provided in advance by both URCM and the BSC. Printing and Distribution Solutions is now a distributor for purchasing branded promotional products that promote our family of brands — UNT, North Texas and Mean Green. This new program will provide the UNT community a below-retail cost advantage and exceptional customer service when purchasing branded products. This program features an online catalog that you can browse with easy to navigate product categories with a large variety of items. Please visit the PDS website to start shopping for your promotional items today. Since June 2011, university departments have been required to obtain UNT merchandise only from licensed vendors. There are many license options through our program, but most businesses will choose either a restricted or local license. A restricted licensee does not create goods for re-sale but instead for university internal consumption only. A local licensee may produce product for the university and is also allowed to produce merchandise for re-sale. A list of licensees (PDF) is available online for UNT faculty, staff and student groups. Click here to download Adobe Acrobat Reader. The University North Texas System and the University of North Texas are the owners of all of their trademarks, service marks, trade names, slogans, graphic images and photography and they may not be used without permission. The university has a legal right to protect its trademarks, service marks, brand names, indicia and other properties from unauthorized use. Usage is restricted to the university and licensees, sponsors and business partners of the university who have been contractually granted permission. To protect against confusion and dilution, the university does not permit private businesses to use university trademarks for their business name except for affiliated entities. If necessary, the university will take legal action to protect these rights. If you have any questions regarding UNT's licensing program, please contact Lora Connaughton. For questions regarding purchasing, please contact Carolyn Cross.